Indie Retro News: The Last Ninja 2 +8DG - Hokuto Force celebrates via the C64 with a big trainer and more! 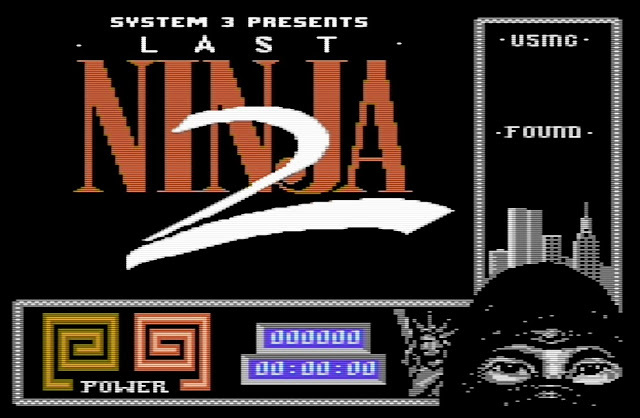 The Last Ninja 2 +8DG - Hokuto Force celebrates via the C64 with a big trainer and more! Are you bored with nothing to play, then come and play a hit C64 classic that pretty much everyone has heard of from the 80's, and one of System 3's greatest action adventure games from 1988 'The Last Ninja 2'; which has now been re-released as a +8DG by Hokuto Force with more than just a quick improvement. This fabulous game has been given the once over by Hokuto Force and not only features graphics fixes, but also a full trainer and with inclusive 1581 version. Hokuto Force is celebrating the anniversary of the saga of the Last Ninja games, and has re-released the Last Ninja 2 : Back with a Vengeance as the sequel to the incredible 1987 game The Last Ninja. This brilliant game was developed and published by System 3 for the C64, Amstrad and ZX Spectrum, with later ports in 1989 for the Amiga, Atari ST, and even the NES. The gameplay is every bit as good as the prequel and even continues from the aftermath of the events of The Last Ninja. A game not to be missed!